The Shimano Hone chainset is for all mountain and cross country use with HOLLOWTECH II crankset and Dual SIS compatible. 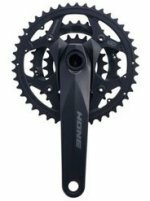 Models include the Hone M600 and M601 double and triple chainsets. Typically featuring: Chain: Super Narrow HG, Crank Arms: forged aluminum/ hollow type, Outer Chainring: aluminum, Middle Chainring: aluminum, Inner Chainring steel, Chainring Bolts & Nuts: stainless steel (bolt), steel (nut), Weight(g): 928 Incl. BB, Bottom Brkt Type: Hollowtech II, PCD/BCD: 104/64, Spider: 4 arm, Chainrings: Triple or double.